True lunatics get their electronics at the Apple Store. I also like the parody of continuations at the end of this episode. I hate those, and I am glad that the Simpsons had only one, maybe two. My favorite Treehouse of Horror segment. 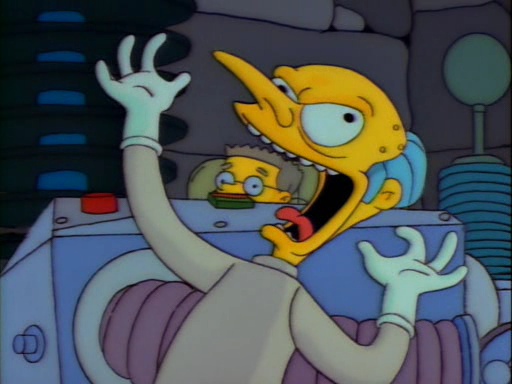 There is nothing – repeat: nothing – funnier than Mr. Burns whistling “If I Only Had a Brain,” saying to Smithers “it’s not rocket science it’s brain surgery,” removing Homer’s brain with an ice cream scoop, and then putting Homer’s brain on his head and proclaiming himself to be Davy Crockett. God, I love Smithers’ head poking up in the background in that shot.